This story begins about 1855. For over a century, it was a roller coaster ride, climbing upward in good times with good-paying jobs, then hurtling down to hard times and unemployment. But it was always exciting and newsworthy. Before Rock Island Plow Company, there was Buford and Tate, a plow manufacturing company owned by Charles Buford and R. N. Tate, that was opened in 1854, 1855 or 1856. After Tate retired in 1864, the name changed to Buford Plow Works. Charles Buford died in 1866, but his sons Basil D. and Louis M. stepped into his shoes, building many types of plows and boosting the local economy by employing hundreds. The company prospered, reporting a weekly production of 500-600 plows. In 1871, the company was reorganized as B. D. Buford & Co., a joint stock company with a capital stock value of $250,000. At the time there were claimed to be 600 employees working in the various shops – foundry, forging, fitting, grinding and polishing, woodshop, and painting. Although the employee numbers may have been exaggerated, this was still big business. The address was “Illinois and Main,” today’s Second Avenue and 6th Street. 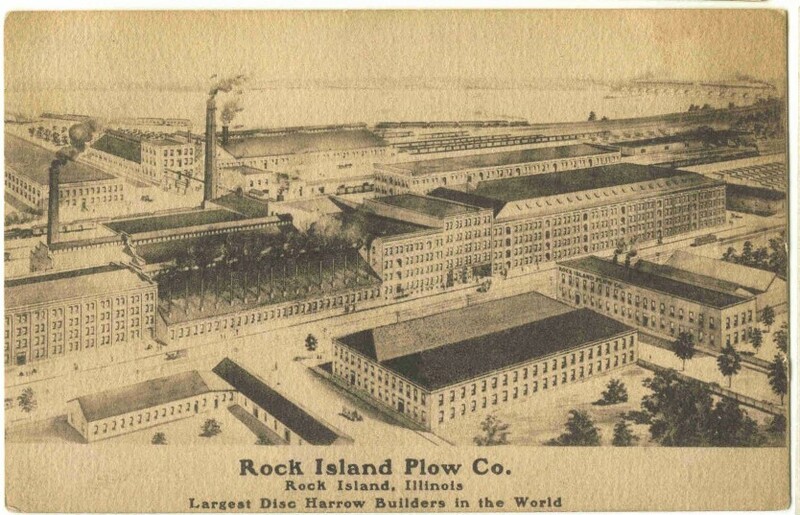 That area was the industrial heart of Rock Island. Nearby factories included a lumber mill, a stove company and a glass works. The skyline was interrupted with a multitude of the tall smokestacks that symbolized the energy – coal or wood — that these industries needed. And business was good. In 1875, the 215 “men and boys” in the factory produced 200 plows during their 10 hour workday. Quality was good, too, and the company received an award at the 1876 Centennial Exposition. Day and night operations were reported in 1877 to meet the demand for plows. Then, double disasters. First, a flood in June of 1880 swept the low-lying plant buildings. But even worse, on the following New Year’s Eve, a fire of “incendiary origin” destroyed much of the plant, putting 475 out of work. By the following August, new structures were nearing completion with Eugene Biddison as the architect. The 81 ft. x 232 ft. manufacturing building was three stories high plus a basement. The fitting shop and blacksmith shop also covered large areas. Some of those buildings may be ones seen on the postcard. New shops were under construction in 1910, including the 8-story warehouse building that remains today. Cyrus D. McLane supervised the construction of that building as well as a 300 ft. x 150 ft. forge shop. Rock Island Plow entered the tractor business in 1914 when it started selling Heider Tractor Company equipment. Two years later it purchased Heider. The ups and downs of the farm implement business continued. In 1921, layoffs were announced, noting that the doors of the factory were practically closed. But in the normal cyclic pattern, by 1928 the factory was running night and day to meet the demand. In that year, the Heider name was discontinued in favor of “Rock Island.” Not very many Rock Island brand tractors were produced, making them a rare collectors’ item today. During the Great Depression, farmers who couldn’t sell their products couldn’t afford tractors either. In 1935, Rock Island Plow stopped making tractors, and in 1937 the company was purchased by J. I. Case, a company that was originally built on manufacturing steam threshers and which had a history as illustrious as that of Rock Island Plow. The postcard shows the Mississippi River and Crescent Railroad Bridge in the background, while Second Avenue runs diagonally from lower left to upper right. Sixth Street enters at the lower right. The sprawling structure in the foreground was later replaced by the 8-story warehouse. The industrial area that once employed hundreds of people is now quiet. Much demolition has taken place and there are huge vacant spaces. Some of the areas are used for storage and for smaller businesses. But the tall 1910 warehouse building, surprisingly modern in appearance, remains a vivid reminder of our Rock Island Plow Company heritage. This article by Diane Oestreich is slightly modified from the original, which appeared in the Rock Island Argus and Moline Dispatch on April 1, 2007.